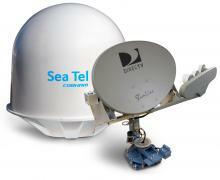 The first 3-Axis marine stabilized antenna system that is compatible with DIRECTV’s Ka-Band satellites. The Model DTV04 HD is also the only marine stabilized antenna system that can deliver 3 Ku-Band satellites (101W, 110W, and 119W) and two Ka-Band satellites (99W and 103W) simultaneously with one antenna system. There is no need to have a second antenna system for Ka-Band reception. The Model DTV04 HD features high performance stabilization and satellite tracking using a 3-axis closed loop stabilization system, providing quality performance in the roughest seas. The Model DTV04 HD has a compact, attractive all-white radome, DVB (Digital Video Broadcasting) signal identification, and Sea Tel’s proprietary antenna control with fasttrack signal lock software.